Pokerstore.nl the #1 source for your poker equipment! Welcome at Pokerstore.nl the #1 source for your poker equipment, casino supplies and gambling products. 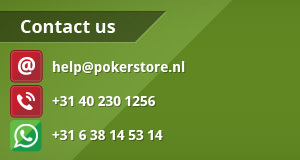 Or send an email to help@pokerstore.nl and we guarantee you a quick response. We are one of the largest online retailers of poker supplies on the poker market in Europe. We sell poker products like: poker accessories, poker books, poker chips, custom poker chips, playing cards, poker sets, poker tables and other casino products. 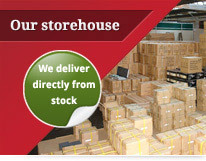 Pokerstore.nl supplies directly from stock from our warehouse in Veldhoven nearby Eindhoven in Holland. 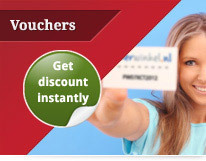 Enter the coupon code from Pokerstore.nl at the checkout and gain instant advantage of attractive discounts! Do you have a question about a particular poker product, international shipping, secure payments, return or exchange an poker item or you just want to share something with us? 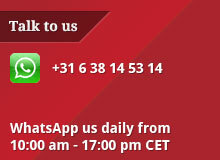 WhatsApp us at +31 6 38 14 53 14 during our business hours from 10:00 am - 17:00 pm CET. Here you can find our other contact information. We would like to talk to you! We will be happy to answer your question! For more information and free advice contact Pokerstore.nl. 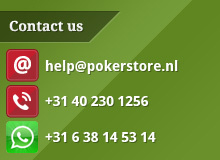 You can also leave a message using our contact form or send an email to help@pokerstore.nl and we guarantee you a quick response. THERE IS A LOT OF DEAD MONEY UP FOR GRABS in the lower limit sit-and-gos one table tournaments, where the first three players split the prize money (50% for first, 30% for second, 20% for third) and Neil Timothy shows you how to go and get it. The author, a professional player, shows you how to reach the last six places of lower-limit sit-and-gos four out of five times and then how to get in the money in about one-third of all tournaments using his powerful, proven strategies! SIT-AND-GOS ARE THE MOST POPULAR FORM of online poker tournaments played today. It is estimated that more than half of all Internet poker players ( and many land-bases cardroom players as well) regularly play sit-and-gos. They're quick tournaments, averaging only one to two hours to play, and lucrative for players who know the inside strategies used by only a handful of pros. The strategies you'll learn here are effective for early and middle stages of one-table satellites and will also give you great insight for big tournaments when you get to the final table! THIS BOOK CAN TURN A LOSING PLAYER INTO A WINNER and a winner into a bigger winner. You'll learn when to play conservatively and let opponents knock each other out, when to get aggressive and even hyperaggressive, plus the specific strategies for various stages of a sit-and-go early, short handed, the bubble, in the money and heads-up. Twenty-five powerful, but easy chapters, show you how to win. After consistent, outstanding success at the tables, Neil Timothy dropped out of college to become a full-time sit-and-go professional player. His tried-and-true methods, for the first time, are revealed here. Cardoza publishing, the world's foremost publisher of gaming and gambling books. Do you have a question about this product or need help with making your order online at Pokerstore.nl? Please call +31 40 230 1256 and get helped by one of our expert at our customer service during our office hours, send a WhatsApp message to +31 6 38 14 53 14 or send an email to help@pokerstore.nl and we guarantee you a quick response. Pokerstore.nl reliable since 2005, the No. 1 store based in Holland! 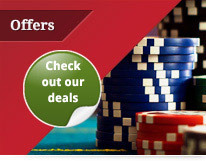 Pokerstore.nl is a Casino4Events company. The mission of Pokerstore.nl is clear and simple. We make it our goal to provide high quality poker offering products and playing cards at competitive prices. All prices listed on our site are inclusive of VAT. Whether you're playing poker with friends at home or at a high level Pokerstore.nl delivers the best products for every budget. All our products are available immediately from stock and we ship in the whole of Europe. © Copyright 2005 - 2019 Pokerstore.nl - all rights reserved.